This is one of the yummiest receipe and its easy to make. The main ingredients are as follow. Curry leaves - 5 or 6 nos. 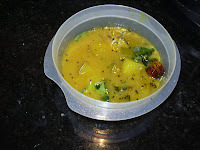 Take a wide pan, put the mangoes in it and add a cup of water, turmeric powder and salt to it. Let it cook for 10 mts. The mango should be tender. Now add the jaggery to it and let it boil for another 2 mts. The consistency should be kind of thick and watery. You should be able to pour it. If its more watery, mix a teaspoon of rice flour with 3 or 4 tbsp water and pour it on top of it and let it boil for another 2 mts. Pachadi is ready now. Now pre heat the oil in a seasoning pan, add mustard seeds, when it splutters add urid dal, red chillies and asafoetida powder. Fry it till golden brown. Pour it on top of the Pachadi and put the curry leaves on top of it. Mix it well. Now pachadi is ready to serve. It will have sour taste from mango, sweet taste from jaggery and spicy taste from red chillies.